Rakuyaji (Koka City, Shiga Prefecture), an ancient temple of the Tendai sect of Buddhism, has preserved twenty Buddhist statues from the Heian period (794–1192) designated Important Cultural Properties. This number is outstanding even in Shiga Prefecture, where a many fine Buddhist statues remain to this day. This exhibition is the first opportunity to show all twenty of these statues outside Rakuyaji Temple. 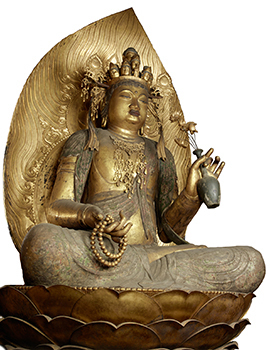 The principal deity, a Seated Juichimen Kannon Bosatsu (Ekadasamukha), is approximately three meters high, exhibiting overwhelming presence. It is a “hidden” statue that is usually kept behind large, heavy doors. 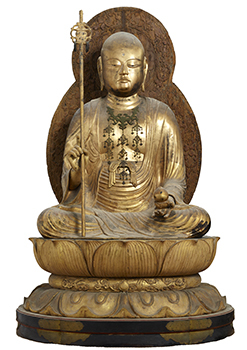 Other works on exhibit include eleven other Kannon (Avalokitesvara) statues, a Standing Bishamon Ten (Vaisravana), which somehow gives a familiar impression, and a Seated Jizo Bosatsu (Ksitigarbha), which is an exceptional statue created in 1187. 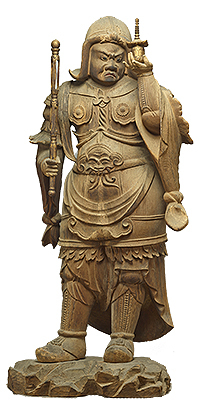 This exhibition shows, in one sweep, masterpieces of Heian-period Buddhist sculpture preserved in Rakuyaji Temple. 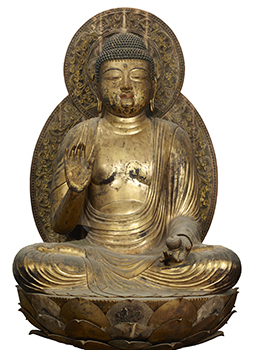 The exhibition period of the special exhibition, The Hidden Buddha of Rakuyaji Temple, Shiga, has been extended. *Closed on Saturday, December 24, 2016 - Sunday, January 1, 2017. *From December 13 onward, tickets can be purchased only at the museum ticket booths by the Main Gate. Advance tickets that have already been purchased as well as complimentary tickets are valid throughout the revised exhibition period. *The Special Exhibition Shop in Honkan (Japanese Gallery) was closed on December 11, and will be closed for the rest of 2016. It will reopen on January 2, 2017 and operate until January 9, 2017. Exhibition catalogues can be purchased at the Museum Shop in Honkan (Japanese Gallery) throughout the revised exhibition period. We would like to thank all visitors who have already viewed this exhibition, and hope many more visitors would take this opportunity to see it. * From December 13 onward, tickets can be purchased only at the museum ticket booths by the Main Gate. * Advance tickets will be on sale at the museum ticket booths (during museum opening hours excluding the last 30 minutes) and other major ticketing agencies from Friday, July 15 to Monday, September 12, 2016. * Special exhibitions "A Journey to the Land of Immortals: Treasures of Ancient Greece" (Tuesday, June 21 - Monday, September 19, 2016, Heiseikan) , and "The Art of ZEN: From Mind to Form" (Tuesday, October 18 - Sunday, November 27, 2016, Heiseikan)　requires separate admission fees. With the Support of TBS Radio, Inc.
With the Sponsorship of Nissha Printing Co., Ltd.
With the Cooperation of NIPPON EXPRESS CO., LTD.